Besides writing few books that have been translated in multiple languages, Otto and his blend of Nietzschean and Homeric political philosophy, helped lay the foundation for the contemporary manifestation of the Counter-Enlightenment, which we call the New Right. Indeed, Otto was part of the political evolution of many European New Right thinkers—Guillaume Faye, Alain de Benoist, and Pierre Krebs, to name but three; yet he remains virtually unknown in America, even among scholars. In Europe, though, the Classical inheritance is lived and understood differently than in America. As Krebs explains, the vitalist natural spirit of the Homeric/Greek religion has stood in continual opposition to Asiatic/Judaic metaphysics since the dawn of the Homeric Age, some 3000 years ago. In America, what we stood to inherit from the Greeks has been, at worst, perverted by Judeo-Christianity’s war on European nobility, and at best, subsumed within the multicultural system of racial and cultural commodity fetishism. In other words, the Classical world matters to Europeans because they still live in the geographical and geopolitical world of the Greeks and Romans; while in America, bored bourgeois consumers think about Greece and Rome only when Hollywood promotes some democratic and ethically Christian version of a formerly noble tale of heroism and glory. Thus, it is to the North American New Right’s credit that the Classics and pre-Christian paganism is discussed at all. But even as we occasionally discuss them, they still seem foreign to the essential discourse of creating and being a new American Right. While there are Nazis, Norse pagans, atheists, and Christians—always quick to de-Jew Jesus—aplenty, Olympian, Roman, or even Augustan reform, pagans are seldom identified. Given the lack of Classical feeling in the American psyche, one must assume that these pagans simply do not exist here. Even in the European New Right’s best explanation of paganism, Alain de Benoist’s On Being a Pagan, Athena and Apollo—the most well developed and useful Homeric deities—are never brought to life. Nor is one given a sense of what one would actually believe and do as a result of associating with these gods. Collin Cleary sensed the “lack of gods” in Benoist’s On Being a Pagan and took offense with its overtly Nietzschean humanism and “moral relativism.” Although the gods are present in The Homeric Gods, Otto’s project, like Benoist’s, is entirely and inherently Nietzschean. In fact, to properly understand Otto’s book, one should begin with Nietzsche, and not Homer. But this is understandable, assuming that one comprehends why Nietzsche is so central to how and why we know the Greeks today. As the first epigraph makes clear, Nietzsche uses the Greeks (and Romans) as a counter-valuation to the modern Judeo-Christian world. From his first notebooks and lectures to his last written words, Nietzsche’s ideal human types are Greek, nay, Homeric in origin. For it was these men that fought, struggled, killed, and died in a life-affirming quest for glory. Nietzsche’s ideal form of life, which glorifies warfare, strife, and beauty, is Greek. Indeed, Nietzsche’s naturalization of morality can be found 2200 years prior in Herodotus’Histories. Nietzsche’s Zarathustra virtually summarizes the first book of Histories when he says that, “No people could live that did not first esteem; but if they want to preserve themselves, then they must not esteem as their neighbor esteems.” For while Herodotus included the narratives that brought war to the barbarian peoples of the east, he did so to show that, while each people is motivated by what is good, the only good that matters is that of the Greeks. Even if Herodotus understood that each of Greece’s enemies had their own moral and ethical system, these systems did not apply to Greeks. The world beyond Greece simply did not exist in moralistic/altruistic terms. This is similar to the motivational thrust of Nietzsche’s critique of Judeo-Christian morality: it might be good for a certain human type, but not for us. This “us” is a key to understanding why Nietzsche is often embraced by the Left (and New Right thinker Collin Cleary) as a moral relativist, for it assumes a preexisting knowledge of each of Nietzsche’s “mature” works that the large majority of his postmodern readers simply do not have. Everything from Book Five of The Gay Science to the last notebook of the Nachlass is written for a fictitious audience of like-minded “free thinkers” who already embrace Nietzsche’s transvaluative project. Thus, he never naturalizes morality “in general” but always in contrast to what is useful for a particular (heroic, strong, courageous, harsh) audience. Ultimately, moralities are important because every form of life has one, or some such system of valuation and evaluation; and each morality is the basis of a particular human type—one of which is democratic, soft, lazy, smug, complacent, flabby, in a word, decadent. But, because that human type is the optimal embodiment of its morality, the form of life’s truth regime also promotes its optimal status. And again, because Nietzsche explains that truth is unknowable without valuation (thus linking truth and morality), and that there are as many truths as there are forms of life, i.e. perspectives, historically speaking, the Left embraces him as a general relativist; just as it critiques Herodotus (and the Greeks) as ethnocentric and xenophobic, and Homer as a violence-obsessed savage. Otto’s The Homeric Gods embraces this generalization of Nietzsche and sets the Homeric gods in opposition not only to Judeo-Christianity but also to the bourgeois form of life in general. What makes Otto’s book unique and useful is that he actually uses Homer and other archaic and Classical sources to explain the gods. Thus, Judeo-Christian and modern notions of sin, soul, piety, and redemption are nonexistent. Writing in the Nietzschean spirit, he celebrates the absence of “the holy” in the Homeric Greek worldview. “The somber religious reverberation, that melody of ineffable exaltation and consecration . . . seems to be wanting . . . This religion is so natural that holiness seems to have no place in it” (p. 3). What we miss, then, is the “moral earnestness” that Judeo-Christianity, as the paradigm of religion, commands us to expect in a religion. Instead, we have gods that are “too natural and joyous to reckon morality as the supreme value” (p. 3). We have, as well, two key points to understanding how the religion works. First, there is no communion between the gods and man. There is no sacrifice of the self, no intimacy, no oneness of god and man. Man and the gods are separated by each one’s nature. Second, there is no promise of redemption in the religion. There is no need or desire to redeem man from his earthy existence because love of life and the natural capacities of man are the basis of Homeric religious feeling. As Faye said, “like Achilles [and Odysseus], the original European man does not prostrate himself before the gods, but stands upright.” But as Otto explains, this is because the gods demand instead that one stands and fights—that one makes oneself worthy of the gods’ attention by courageous and heroic action. Otto brings this point home by reminding his readers that, while in the Old Testament, “Yahweh fights for his people, and without making any defense they are delivered from the pursuing Egyptians,” in Homer, “a god whispers a saving device to a baffled warrior at the right instant, we hear that he rouses spirit and kindles courage, that he makes limbs supple and nimble, and gives a right arm accuracy and strength” (p. 6). Man is not miraculously delivered by his God but is, instead, given the inspiration to command his own destiny. The interaction between gods and man and between man and nature, then, is not only dependent upon man but upon nature. In other words, there is little to no magic, only the divinity of man in nature. Speaking of its essence, the divine is a vital force that flows through each living thing. However, it is not “made divine” in the sense of the “holy spirit.” There is no need to feel universally connected to, or prohibited from attacking or devouring, one’s brothers-in man. For in nature, all life consumes and devours, but is still part of the richness of the world—a very Nietzschean naturalism this is! Homeric religion, in sum, dismisses morality, promises no redemption, and makes life itself divine. It is in the descriptions of the gods, themselves that we find the true “plan” that the Homeric religion holds for man: that our divine nature demands that man act, and often heroically. “The gods belong on the side of life. In order to encounter them the living must move, go forward, be active. Then the gods encompass the living with their strength and majesty and in sudden revelation even show their heavenly countenance” (pp. 265–66). It matters not so much that man be patient, pious, or priestly, but that he not act cowardly, brutishly, or without dignity. 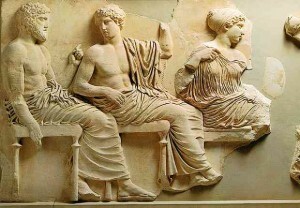 “The purpose and goal of the Greeks,” Otto quotes Goethe, “is to deify man, not to humanize deity” (p. 236). Even as man in all of his nature is deified, Homer still presents a perfected vision of this nature. 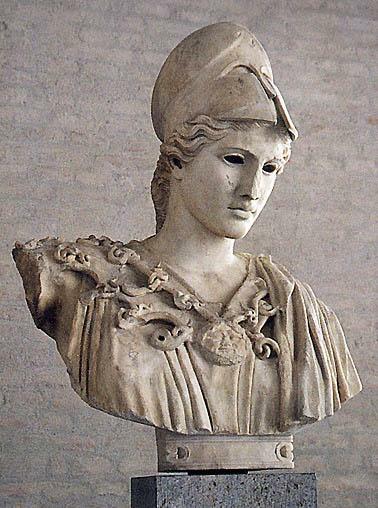 Anyone who has read Homer (or Otto) can hardly disagree that Athena is the most extraordinary of the Homeric deities. Her role in the life of Achilles and Odysseus alone is enough to inspire men to war in hopes of garnering her attention. “First of all it is the warriors whose courage she kindles. Before battle begins they sense here inspiriting presence and yearn to perform heroic deeds worthy of her . . . the spirit of the goddess causes all hearts to thrill with battle glee” (p. 45). 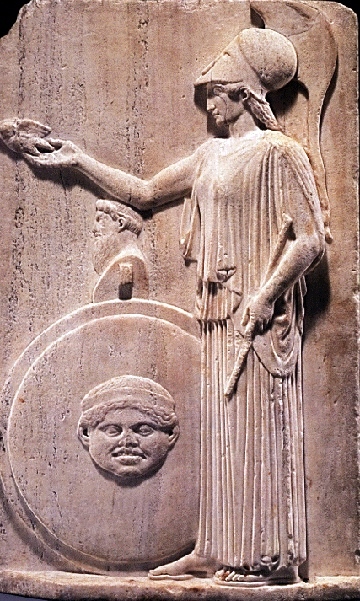 Athena’s association with Heracles insured that she was the deity of choice for virile, athletic warriors, and his glory set the standard for Greek (and Roman) heroic endeavor. Remember correctly, though, that Heracles did not succeed through fury alone. Under Athena’s guidance, prudence and dignity are also necessary. Thus do we see her counseling Odysseus in moments which call not only for force but also shrewd calculation. While her most celebrated recipients are, indeed, warriors and heroes, Athena’s influence can be seen across a wide spectrum of Greek life. She is a warrior, but she is also the goddess of wisdom. Moderns hear this, and their bourgeois form of life immediately informs them of a contradiction; for how can war and wisdom be unified and idealized to the point of divinity? That this unity is no contradiction, however, says all one needs to know of these Greeks and how far we have fallen from their glorious and heroic ideals. War and wisdom are related, through Athena, by the type of human perfection needed to be victorious at either. Precision. Precision under pressure. Precision under pressure of death. Precision under pressure of death when only the perfect movement or thought will preserve life and achieve one’s glory. Wisdom can only be gained in similar circumstances—through heroic or precise, pressure-filled, action. Thoughts gained while sheepishly static and immobile, Nietzsche reminds us, are seldom heroic. Thus warriors in need of the perfect throw of a spear or slice of a sword, in the only instant that will kill their opponent, are united with artisans, artists, precision craftsmen—shipwrights, metalworkers, potters, weavers—and anyone needing intelligence and the will to decisiveness at every moment. While Athena loves others beside the great heroes and warriors, her spirit and approach does not change circumstantially. She always desires “boldness, the will to victory, and courage,” but these are not fully useful without “directing reason and illuminating clarity” (p. 53). “Whenever in a life of action and heroism great things must be wrought, perfected, and struggled for, there Athena is present. Broad indeed is the spirit of a battle-loving people when it recognizes the same perfection wherever a clear and intelligent glance shows the path to achievement” (p. 53). Broad indeed is the spirit of a battle-loving people when it recognizes the same perfection wherever a clear and intelligent glance shows the path to achievement. Otto has just explained the crux of the Classical inheritance: the will to perfection. Stand alone in postmodern America and ponder the magnitude of a cultural impulse to perfection. Now also consider Otto’s National Socialist audience and one also begins to sense what National Socialism and Fascism were really up to—and how deep was the Fascist critique of modernity. Apollo is an archer, thus the will to precision is also present in him. But while Athena is immediate and near, Apollo is rational and distant. 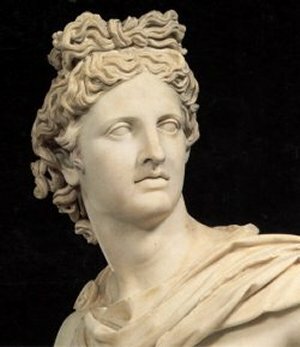 “In the figure of Apollo,” Otto explains, “man honors the nobility of serenity and freedom, the rays of the sun, which furnish light not for mysteries of the soul but for virile realization of life and worthy achievement” (p. 252). Once again, Otto makes sure we fully comprehend the cultural impetus of these deities. For like Athena, Apollo promotes a world of meaningful action and a life “capable of freedom, which neither follows impulses blindly nor is subjected to the categorical demands of a moral legislation. It is not to dutifulness or obedience that decision is allowed but to insight and taste; thus everywhere the intelligent is bound up with the beautiful” (p. 253). It was the genius of the Greeks to promote the most exceptional and exemplary capabilities of man as divine; and not only divine but also natural. Thus man did not supplicate himself to a God, or, as Collin Cleary fears for neo-pagans, merely invoke the name of a deity. Instead he made himself worthy. “Wherever a great heart throbs and rages, wherever a liberating thought flares up, there Athena is present, summoned rather by heroic readiness than by humble supplication. From her own lips we hear that she is attracted by prowess, not by good will or devotion to her person” (pp. 238–239). In this we see that the agonic pulse that ran through the Greek world was more than just a will to prepare for war. It was also a means for men to maintain worthiness of the gods. For a perfect throw, a perfect hull, or a perfect word is still perfection and “for the Greeks, this is the prime meaning of insight and intelligence. Without these the truly divine is inconceivable” (p. 247). Perhaps nothing separates modern man from the Greeks as much as his aversion to thinking about the human in terms of perfection. The artistic embodiment of the Homeric deities served as an optimal status criterion of the form and content of human perfection. Extremely elevated standards were maintained in physiognomy, creativity, and discernment, always with a view to the interconnectedness of warfare, wisdom, and beauty. Grandeur, prowess, dignity, and nobility seem available for all who act heroically and with nobility. However, this is only so because it is not the mediocrity of the rabble that is being elevated to the pinnacle of human worthiness. Only a modern would think to celebrate (or even care about) the Helots and slaves that toiled in the shadow of greatness. Indeed, the moderns who glorify the non-victorious and the failures—the majority—at the expense of the heroic and life affirming few, dwell in eternal darkness compared to these Greeks. Instead this is a religion (and form of life) for masters. This is the religion of those who value glory over justice. And, “for a spirit which craves glory rather than prosperity, the justice of divine sway is a different thing from what the husbandman or commoner intent on possessions and gain might wish it to be” (p. 258). Achilles, the bravest and “most loved by the gods” of the Greeks at Troy, has a short life, but it is a life filled with the greatest imaginable glory. As Otto deftly explains, only a spiritually poor age would think to reduce the human capacity for heroic action to a search for bourgeois comfort, safety, and happiness. Likewise, only a spiritually impoverished religion would feel it necessary to make God an arbiter of justice. While the “history of religions” (i.e., modern theology which makes Asiatic monotheistic religions the paradigm of religiontout court) considers it a deepening of divine providence to give God the power of justice, Otto explains that it as a sign of decadence (p. 257). The Homeric gods, as mentioned above, are solely deities of life. Death, the only fate of man, is controlled by the furies—the archaic deities more closely related to elemental forces than the more spiritual Olympians. It is not fated that a man does anything but die. What he does with his life is up to him, including meting out justice. (In his Oresteia, Aeschylus presents a dramatic account of Athena and Apollo arguing successfully against the furies for the right of man to justice.) While the gods are powerless against death and care nothing for justice, they often work with a man’s fate to allow a maximum amount of honor and glory. For a form of life that spiritualizes life, honor, and glory, a “call to justice is . . . a sign of the de-deification of the world” and evidence of a mobbish right to prosperity and slavish assumption that someone may be blamed for one’s suffering a lack of prosperity (p. 258). 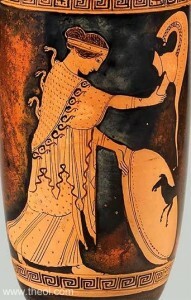 It is important to remember that Homer was the basis of Classical Greek culture. 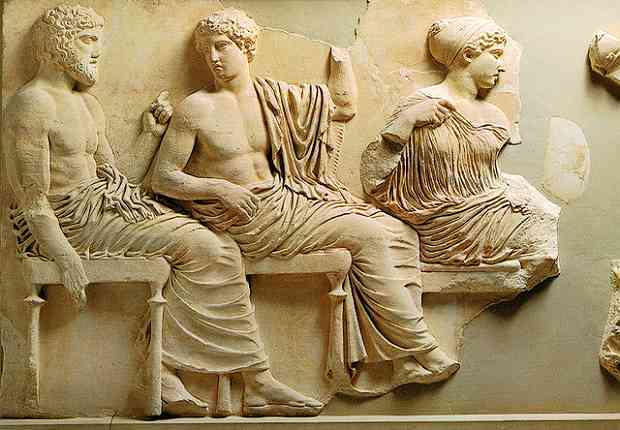 The deities and heroic men and women he described originated the shared values, mores, and conditions of possibility of the many Greek peoples. Homeric models of heroism and nobility became the boundary marker between the Greek and the barbarian. The metaphors used by the nobility and freemen alike came from Homer, as did the bases of truth, beauty, and good reasoning. The Homeric Gods gives ample reasons why this was so. With its Nietzschean undertones (Nietzsche is only mentioned once in the book) and its clear delineation of what separates the Homeric from the Judaic, Otto’s study must have been intended to bolster the Fascist reawakening of Classical feeling in European man; for it paints a picture of the very type anti-humanist (Nietzschean) humanism that characterizes so much of Fascist political mythology and philosophy. What makes Otto’s The Homeric Gods so important, in this light, is its sheer monumentality. It explains that Greek humanism was anything but secular, and deified the greatest potentials of human life. It places life clearly in the control of man, with the understanding that greatness is only achievable through actions worthy of the gods. The book is designed to inspire—to make Athena’s touch be felt again—and to give notice that bourgeois modern men will be unforgivingly outmatched by those seeking glory rather than comfort. The Homeric Gods is no substitute for the remarkable experience of reading or hearing Homer’s epics. However, it is a companion that will deepen one’s experience of Homer so much that Dominique Venner’s suggestion that his epics act as a “European bible” will make perfect sense. Of course, heroic men of the Homeric ideal have no need of a bible—just as the Nietzschean ideal would chafe at the blasphemy of suggesting Zarathustra as a bible. If bible is a strong word—intended only for the weakest ears, that is—perhaps Homer can instead act as guidebook of the European peoples’ capacity for greatness. Friedrich Nietzsche, Writings from the Early Notebooks, ed. Raymond Geuss and Alexander Nehamas. Trans. Ladislaus Löb (Cambridge: Cambridge University Press, 2009), p. 203. Walter F. Otto, The Homeric Gods: The Spiritual Significance of Greek Religion, Trans. Moses Hadas. Reprint Edition (North Stratford, NH: Ayer Company Publishers, 2001), p.12. Pierre Krebs, Fighting for the Essence: Western Enthnosuicide or European Renaissance? Trans. Dr. Alexander Jacob (London: Arktos, 2012), pp. 46–47. Alain de Benoist, On Being a Pagan, ed. Greg Johnson, trans. Jon Graham (Atlanta: Ultra, 2004). Collin Cleary, “Paganism Without Gods,” in Summoning The Gods, ed. Greg Johnson (San Francisco: Counter-Currents, 2011), pp. 62–80. I assume everyone has read and re-read both The Iliad and The Odyssey. If not, drop everything, get an audiobook, and listen to these epics. Friedrich Nietzsche, Thus Spoke Zarathustra, ed. Adrian Del Caro and Robert B. Pippin. Trans. Adrian Del Caro (Cambridge: Cambridge University Press, 2006), p. 42. Herodotus, The Landmark Herodotus: The Histories, ed. Robert B. Strassler. Trans. Andrea L. Purvis (New York: Pantheon, 2007), pp. 112–15. There is no distinction to be made between postmodern and Left. Maudemarie Clark, Nietzsche on Truth and Philosophy (Cambridge: Cambridge University, 1990). Elizabeth Vandiver, Heroes in Herodotus: The Interaction of Myth and History (New York: Peter Lang, 1991). Guillaume Faye, “Mars and Hephaestus: The Return of History,” trans. Greg Johnson, in North American New Right, Volume 1, ed. Greg Johnson (San Francisco: Counter-Currents, 2012), p. 239. Space and necessity permit only a focus on Athena and Apollo. The Homeric Gods offers chapter-length examinations of Athena, Apollo, Artemis, Aphrodite, and Hermes; while Ares, Poseidon, and Hephaestus also feature heavily. Zeev Sternhell, The Birth of Fascist Ideology: From Cultural Rebellion to Political Revolution, trans. David Maisel (Princeton: Princeton University Press, 1994). Dominique Venner, “Homer: The European Bible,” trans. Greg Johnson, in North American New Right, Volume 1, ed. Greg Johnson (San Francisco: Counter-Currents, 2012), pp. 220–36.